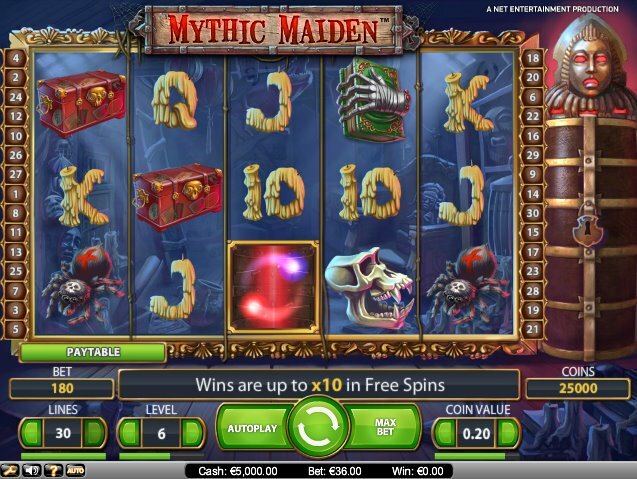 Myth, magic, mystery and maidens always make for mammoth mega slots online, and while I steadily run out of words beginning with 'M', let's take a look at slot developer NetEnt's online slice of mythology - Mythic Maiden. If you’re into fantasy-inspired slots – and who isn’t? – you’ll be pleased to know there’s plenty of choice in the world of online slots. While Microgaming’s lush Arthurian-tinged online video slot, Avalon, and Play'n Go’s fairy-filled slot, Enchanted Meadow, light up online casinos, Net Ent are still hanging in there with Mythic Maiden. 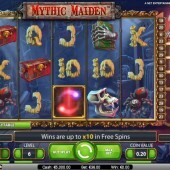 With coin ranges from $0.01 to $0.50, and a top bet of $150 possible across the 5 reels and 30 paylines, Mythic Maiden appeals to wallets of all description. On the reels we get some suitably lush graphics, with a locked treasure chest, some eerie 10-through-Ace symbols in the form of candles dripping wax, a deadly spider, a monkey skull, a shrunken head and a spell book. The Wild moon icon substitutes for all symbols other than the Scatters, and Wild wins have a 3x multiplier attached so it makes it worthwhile to keep an eye out for these Wilds because some decent wins can be had with them. The Scatter magic wisps icon triggers a generous free Spins round when you hit three or more across the reels. Three Scatters awards 10 free spins, four gets you 15 spins, while five Scatter icons pays out a top whack of 30 spins. During the free spins round, the right-hand side of the screen transforms to feature a deadly iron maiden torture chamber (not, sadly, the equally deadly British heavy metal group of the same name). On every spin the iron maiden will open to reveal extra spins or multipliers at random. You can bag yourself a multiplier up to 10x and/or 1 or 2 free spins on each spin. With a sweet RTP it certainly pays to play Mythic Maiden. Just try and avoid any British heavy metal groups while you have it on.